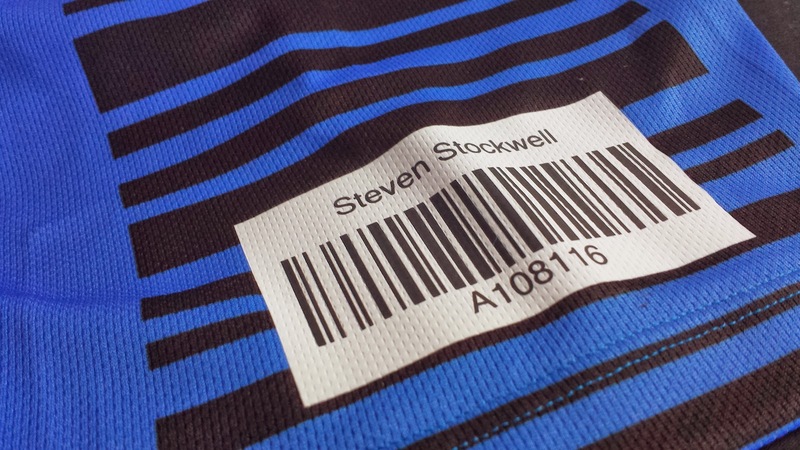 As part of their range they have produced a running shirt which incorporates a runner's own personal barcode for those Saturday morning runs that we all love. I am of course talking about parkrun, but as the t-shirts are not officially endorsed by parkrun, you won't find any mention of the 'lower case p' word on the Miles Stronger website. At the time of writing, they have two short-sleeved designs available. One is green with a touch of white and a grass pattern across the chest area - on this shirt, the personalised barcode is on the front hem. 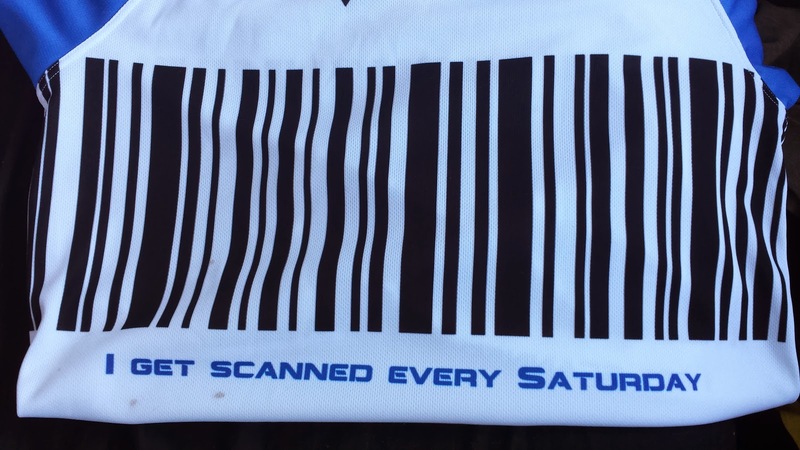 The other is white with blue sleeves and a barcode design that runs around the chest and back areas, along with the phrase 'I get scanned every Saturday'. The barcode design is also present on the sleeves. This design has the personalised barcode on the sleeve. Update (Feb '14) : There are now additional designs available. The process of ordering from their website is simple enough and fairly similar to what you might expect from any on-line store these days. You have to go through a quick registration process, you can then place your order - adding your name and barcode details when you select the product. The expected delivery time when I placed my order was around 2-3 weeks (mine took the full 3 weeks to arrive), but they have now got this down to 1-2 weeks. The shirts are priced at £35.00, plus you'll have to add another £4.20 to cover the postage and packaging. 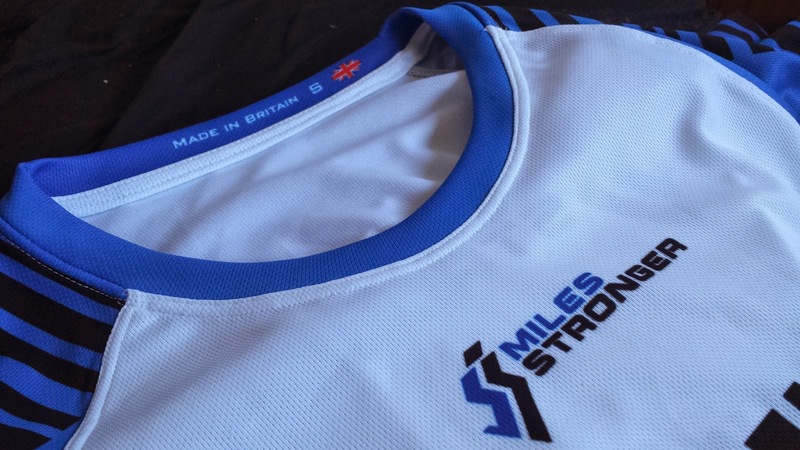 For each shirt sold, Miles Stronger will donate 50p to parkrun UK. Update (Feb '14) : Since reviewing the t-shirt they have introduced an XS size option to the Mens and Womens ranges. When I buy running shirts, I typically end up buying the mens XS as I usually find an S can be baggy around the midsection and sometimes also too long. The smallest men's size on offer is the 'S', so I ordered that one. The S provided by Miles Stronger is what I'd expect from an S. The fit around chest and shoulders is perfect, as is the sleeve length. The overall length is just about ok - any longer and I'd find it too long. The only things I'd really change is the fit around the neck, which feels quite wide, and the midsection, both of which I would prefer slightly smaller. However, the fit around the midsection still falls within the acceptable range and doesn't flap around whilst running. It is worth noting that I am of the shorter variety and very slight in build so often have these same issues with all running shirts. In the box with the shirt was a leaflet containing some brief information on the five UK companies that are involved in producing the shirts and also information on best washing procedure, tips for successful scanning, and information on the barcode guarantee. This simply states that if you have problems with the scanning of the barcode, you can return the shirt to them within 30 days and they will reprocess the barcode and return the shirt. As a running shirt it's actually very good. It is 100% polyester and the fabric has a high quality feel to it. As for its wicking properties, I won't really be able to give that a good test until we reach the warmer months again, but initial signs were good. The shirt has 'Made in Britain, the size, and a Union Jack printed onto the fabric on the inside of the neck. During running it feels very light and airy and is very comfortable. 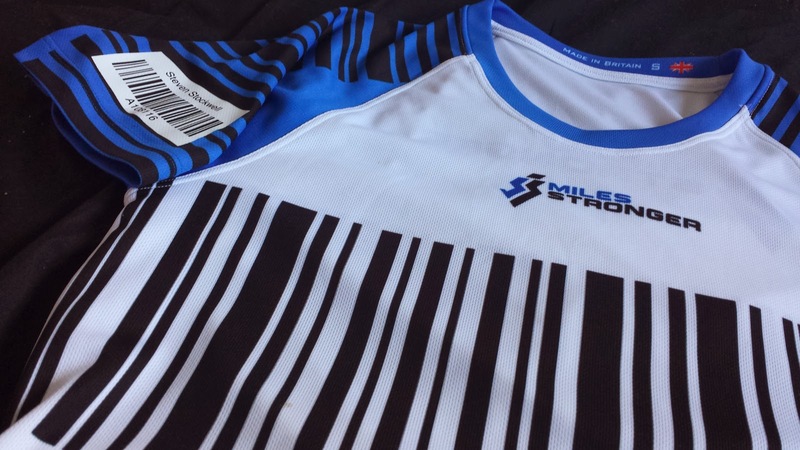 The barcode, along with the runner's name and athlete number is printed onto a panel which is embedded into the right sleeve of the shirt. 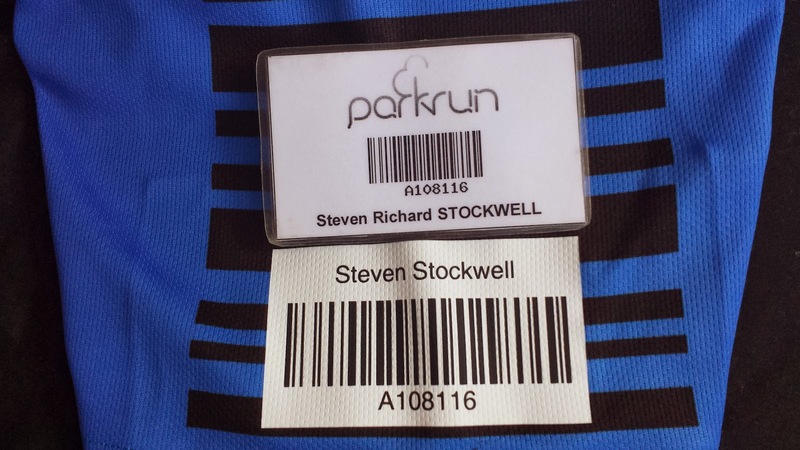 The barcode is larger than the standard issue parkrun barcode and requires the barcode scanner to be held a little further back than usual in order to be read. Miles Stronger recommend a distance of around 8-10 inches. After my first run in the shirt, the volunteer on scanning duty held the scanner too close and the scanner wouldn't read it, but once the volunteer had moved the scanner back slightly, it scanned with ease. As far as the longevity of the barcode - it feels well put together but a longer test period will be required before I can really comment on this. As a company, I really like what they are doing here with the whole Made in Great Britain thing. So if you like the idea of having your barcode printed on your shirt then this might just be for you. If you're not sold on the idea of having your barcode on your shirt or if they are outside of your price range, it's still worth having a look at their standard range of running shirts, which are a little cheaper and you can still buy one in the knowledge that you are supporting designers and manufacturers in Great Britain. Additional photos of the shirt in action can be found in this blog post. My main parkrun barcode blog post with all of the various options can be found here.